When somebody mentions vinyl flooring, the first image that might come into your mind is what was so commonly used a couple decades ago. That type of vinyl is still available, however, there are other types of vinyl on the market today. The other two types are luxury vinyl tile (LVT) and VCT vinyl tile. These two are worlds apart in appearance and style, durability and stability, cost, and the applications they are most suited for. Appearance & Style – VCT is a flat, compressed product available in limited design, texture, and pattern options. 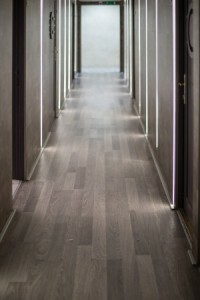 On the other hand, luxury vinyl tile is easily designable, has practically endless pattern and color options, and comes in versions that mimic other flooring materials, such as marble, stone, wood, tile and concrete. Durability & Stability – VCT is very sturdy and durable provided it is maintained properly and was installed with care, especially with subfloor preparation. 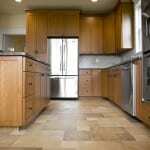 Luxury vinyl tile withstands high traffic nearly as well but is much easier to clean and maintain. Furthermore, many of the patterns and textures available do a remarkable job of hiding dirt. Cost – While VCT has a lower upfront cost, the continual maintenance costs involved with waxing and polishing can make it costlier over time than luxury vinyl tile. 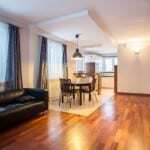 You’ll also find that LVT is lower in cost than many other flooring materials. Applications – VCT is most commonly used in commercial settings, such as in the healthcare and education industries. Luxury vinyl tile is popular in homes and in several commercial industries where appearance is of concern, such as retail stores and restaurants. If you have more questions about luxury vinyl tile and how it compares to other flooring, please contact us at Wright’s Carpet. Feel free to stop in at our showroom or call to schedule an in-house consultation.